Some people thrive on DIY home activities, adding their own style and character within the confines of their home to make it unique, interesting and an of their personality. 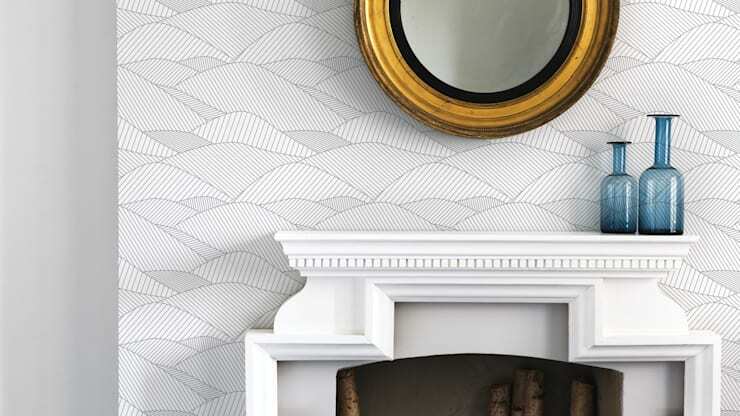 This is why a DIY wallpaper project might just be the perfect long weekend family project! These tips and tricks aim to simplify the fabric wallpaper DIY task, taking out all the stress of where to begin and providing the facts of how to get started. It might still scare you to dig into this fantastic decorative home improvement idea, but that doesn't mean you shouldn't give it a try. Begin with one wall and take it from there. Eventually you will be hooked on creating these original masterpieces in every room throughout your home! The nice thing is that this decorative option can be changed as often as you like and the fabric can be reused. So, that's your new tablecloth sorted, too! Using fabric as a wallpaper option allows for the aspiring home decorator to really emphasise their personal character and traits within the home. Choosing the fabric however is not that difficult either, with the options being potentially limitless! Have a look at some thin cotton options or how about those old bed sheets that you've never used? They might make the perfect inexpensive route for this first time DIY project, so go ahead and check what you have available before forking out funds to buy some fabric. Of course decide on the wall you would like to tackle and measure out the area before getting started on anything else. It may also be worthwhile to use a fabric that has some sort of texture or vibrant colour to it, adding more drama to the space. When deciding on a fabric with repeat patterns, its best to choose something with a smaller print so that there is more repeats, larger print means less repeats and more fabric that would need to be purchased, making it more expensive. 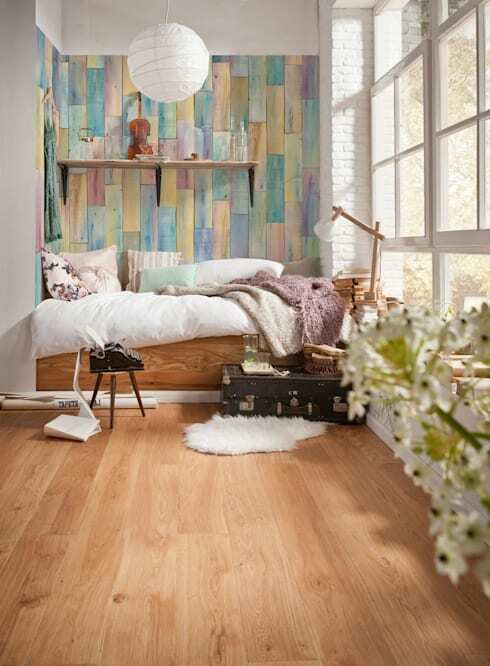 For more exciting print inspiration, check out: 7 Trendy Wall Decors To A Special Home. Now that you have your fabric picked out, it's important to look at the tools and materials you will need to get the task to completion as quickly and efficiently as possible. Sticking down fabric wallpaper can be done with starch, there are two options for this: a starch spray that can be purchased or a DIY cornstarch solution that can be made. It is also imperative to measure out your fabric strips that will be placed along the wall and cut them up to the required size. The tools required for this task include a pair of scissors, paint roller or large paint brush, a craft knife and a mixture of water and cornstarch. Always make more paste than is required to get to the edges after the bulk of the fabric is stuck. The mixture is made with boiling water and cornstarch that becomes thickened and has been allowed to cool before use. Before starting any project it is important to gather tools and equipment that may be necessary in one place so that each tool is easy to find. 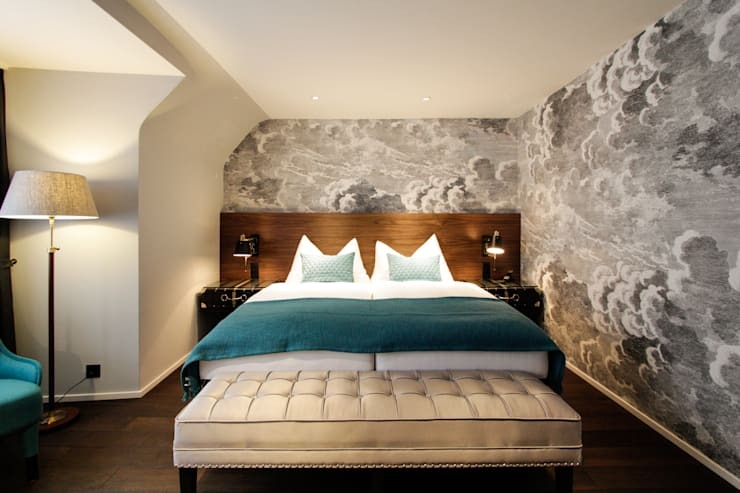 However, in preparing for wallpaper placement, you will need to prepare the fabric, prepare the paste and also not forget about preparing the walls. Begin by combing the walls with a smoothing tool to get rid of any bumps, then fill up any holes left in the walls by nails and screws. Allow the filler to dry and then lightly sand the remaining residue, thereafter wipe the wall with a damp rag and let dry for three hours. 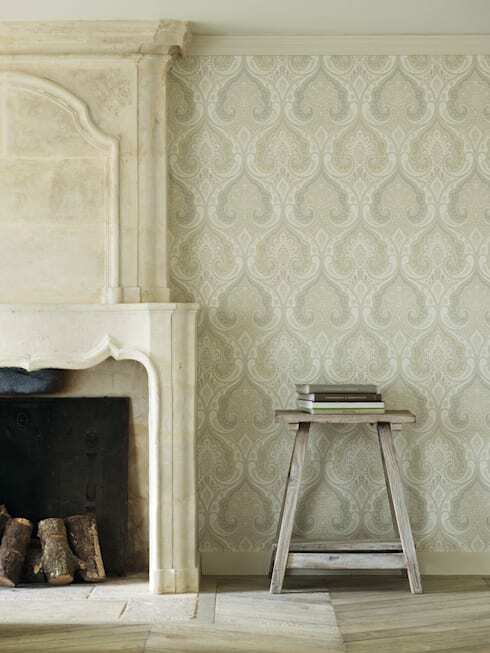 While doing so measure the wallpaper and cut into required segments for perfect placement along the walls, ensure that the paste is at hand and has cooled enough before getting started with the actual sticking process. If your fabric has a bit of a brighter colour to it, you may want to wash it and dry it before actually getting started with the whole project, colour tends to transfer and run with the paste mixture. When preparing the fabric wallpaper for the pasting process ensure that the cut up segments allow for overlap of repeats, which is key to making a wallpapered area look seamless and perfect. Begin by applying the paste directly to the wall, by dipping the brush into the paste and spreading the paste onto the wall from top to bottom. Then begin placing the fabric wallpaper onto the wall, again from top to bottom. Smooth out and adjust as you progress from top to bottom and apply more paste if necessary. Also, bubbles might appear underneath the fabric, smooth these out too with a smoothing tool. It might seem like a lot of hard work, but the end result of this DIY fabric wallpaper project is bound to make your home feel that much more cosy and inviting, while having an interesting piece added to the wall at the same time. By editing the fabric we mean having a look at where the plug sockets are in the wall, where the skirting is or where the mantelpiece begins and cutting around the edges carefully with a scissors or craft knife. This is necessary to ensure that the entire space is neatened and tidied to make the wall of this room perfect in every way. Cutting around the objects that have been placed against the wall with a craft knife ensures a cleaner cut with less mistakes, a scissor is bulkier and less precise. Then patch up and check the wallpaper again for any straggly edges that need to be cleaned up or that are slightly out of place and need more paste. Apply more paste to the edges to ensure that they stay stuck and look neat. 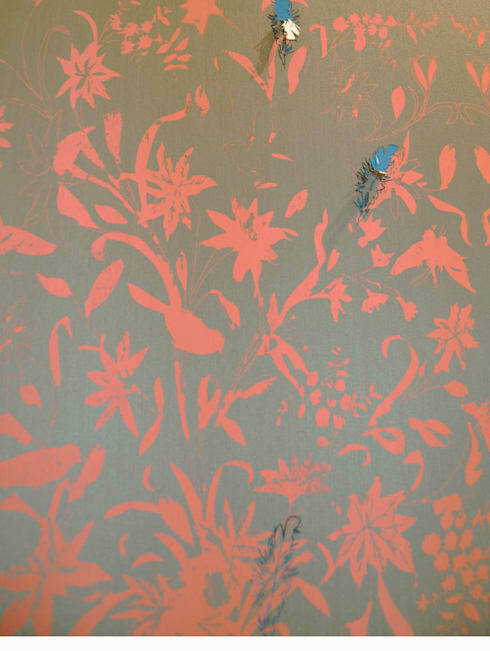 For more wallpaper print designs for a decorative edge, take a look at these inspirations from Paper Moon. To finish off the entire effect of the wallpaper, decide if one wall as a focal point is the choice for you and then perhaps paint the rest in a more neutral tone. Then add some awesome furniture to complete the space, maybe a few scatter pillows that pick up from the colours that have been included in the fabric wallpaper. Decide on whether or not the wall requires anymore accessories, how about some shelves for a clever yet minimalist storage solution for books or ornaments. Include some stunning ambient lighting that goes with the mood of the room. To complete the room off have a look at the floor and add in a funky rug for a warmer and welcoming effect and then complete the entire look with some beautiful flowers, bringing the outdoors inside and adding an amazing smell to the space at the same time. We hope you enjoyed these fabric DIY ideas from the homify team! 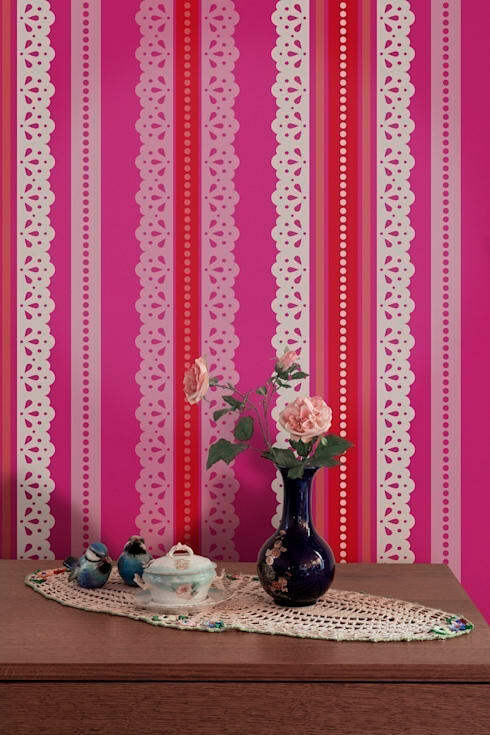 Are you considering a DIY wallpaper project? Let us know!